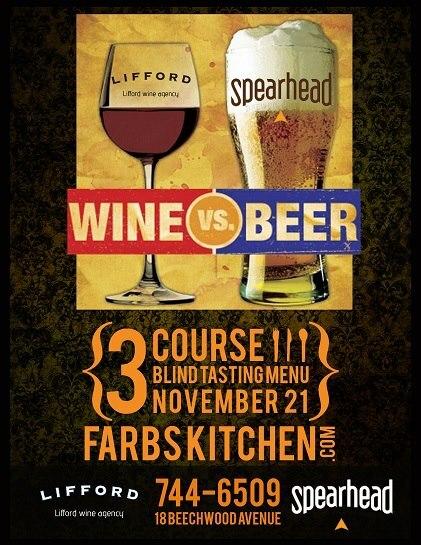 In what looks like a battle for an Iron Publican, Lifford Wine Agency will be taking on Spearhead Brewery in an all out brawl at Farbs Kitchen and Wine Bar in Ottawa next week. 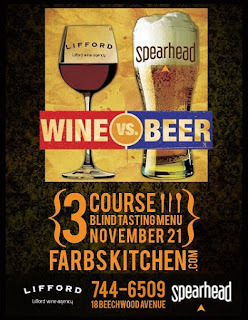 On Wednesday November 21, 2012, Dimitri (Spearhead) and Andrew Rasta (Lifford) will be battling it out during this three course blind tasting event. Located in picturesque New Edinburgh, a stones-throw from Ottawa's Byward Market, Farbs Kitchen and Wine Bar serves upscale bistro-fare in a casual, friendly atmosphere. Chef/owner Michael Farber and his staff take pride in creating new dishes made from local ingredients. It will be interesting to see what he comes up with to showcase the complexities of both the wines and the beers. To reserve your table for this fun, informative and tasty dinner, call the restaurant at 613.744.6509.